So, Opening Night didn't go quite as I'd hoped for my beloved boys in blue. The defending World Series Champs and their powerful offense was completely stymied by Carlos Martinez and the rival Redbirds for most of the night. Then, Willson Contreras smacked a three-run homer in the top of the ninth frame to inject some life into the listless Cubs. It was an improbable comeback that ALMOST culminated in a memorable victory. Unfortunately, in the bottom of that same inning, Mike Montgomery wasn't exactly sharp and the game slipped right back out of their grasp, courtesy of Randall Grichuck walk-off. 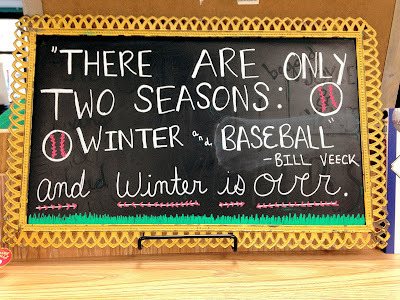 But, that's okay - the Cubs aren't going to go undefeated (though, 161-1 is still a possibility). As such, that loss barely made an impact on my cheerful mood. After all, I still had one heckuva a weekend, perhaps the most productive two-day period for my collection in several years. 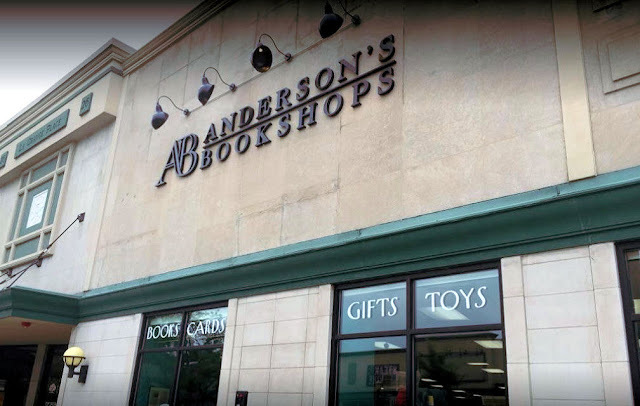 It all took place here - Anderson's Bookshops in La Grange, IL, home to a charming downtown area filled with thriving local businesses. My wife and I made plans to patronize one of these vibrant establishments for dinner and drinks with a pair of our friends. But, for once, we were both ready well before it came time to meet our buddies; seizing that opportunity, we decided to head north early and check out the rest of that "merchant's row." Seeing as how we are both avid readers (one more so than the other), it should come as no surprise that we ended up in Anderson's Bookshop. Yes - Anderson's and I were going to get a long just dandy. They're playing cards... but they're also baseball cards! 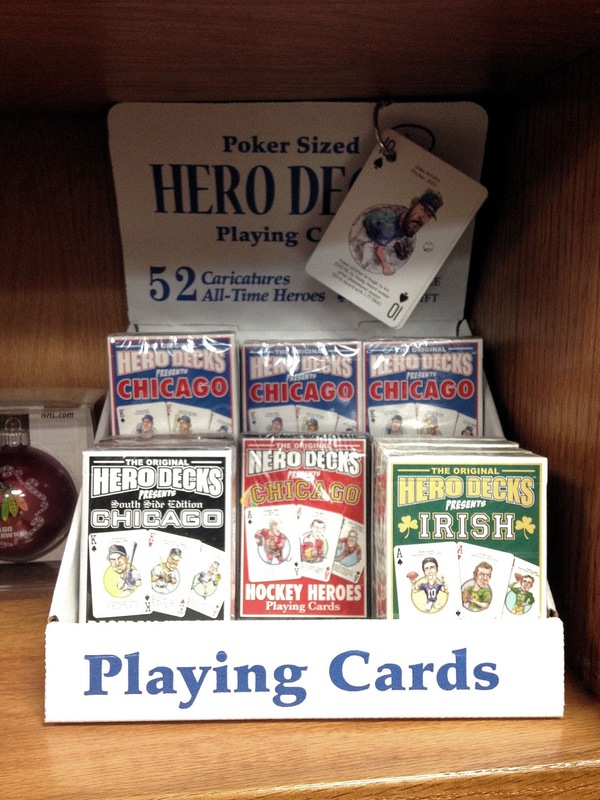 Hero Decks has been in the playing card business for man years now - somewhere around fifteen years or so, total. 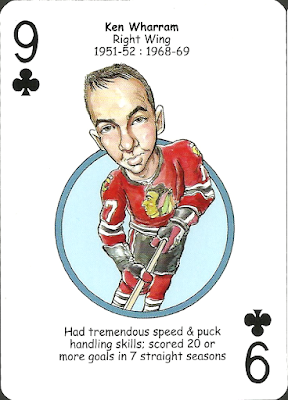 Along the way, they've put out countless, caricature based playing card decks for sports teams across the MLB, NFL, NHL, collegiate, racing, and non-sports ranks, including a 52 card set for the Cubs. I've seen these unique oddballs appear on the blogosphere every now and then, but definitely not TOO often. 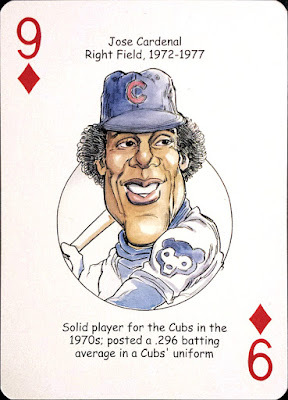 As Jose Cardenal and Shawon Dunston illustrate, these cards feature cartoon drawings of legends, fan-favorites, and current stars along with a positional designation, the player's tenure with the club, and a brief description as to why they were so memorable. 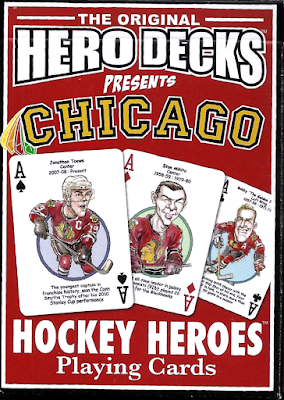 Of course, they were originally intended for poker nights with the boys; however, I immediately split mine up into my Cubs binders... as I'm sure many a fellow collector did, as well. 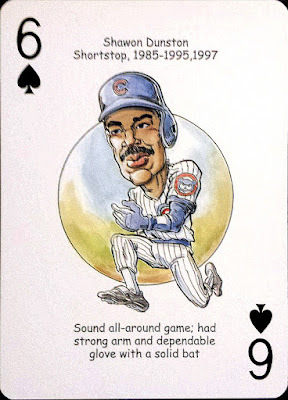 I originally bought the Cubs deck way back in the year 2004, in the midst of the Cubs hype train that was running full-steam after the '03 playoff debacle; coincidentally, that was also timed out right around my great baseball card collecting revival (not a coincidence). 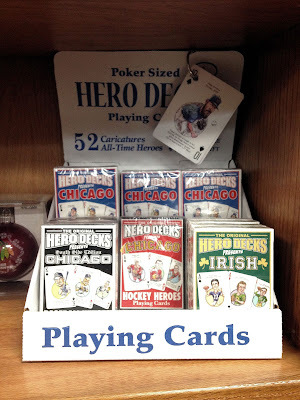 There Hero Deck was on the display counter of my childhood LCS, which has since shuttered it's doors, and it was one of my first purchases after re-entering the hobby. I don't think I'd seen them in a brick and mortar store since. So, while it was pretty nifty to see them pop up again, in a random book shop, I wasn't going to open my wallet for these again. No need to - I've had them for thirteen years now, right? Well... Jake Arrieta definitely wasn't a Cub in 2004 - he was only a senior in high school, at the time. 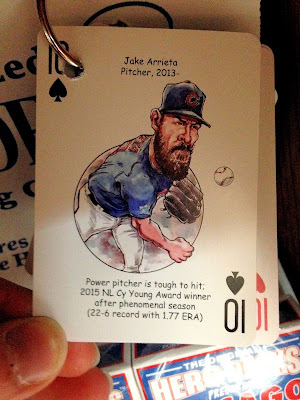 A few example cards hooked on a key ring at the top of the display keyed me in to the fact that the Cubs deck has gotten a makeover sometime since the beginning of the 2016 season. 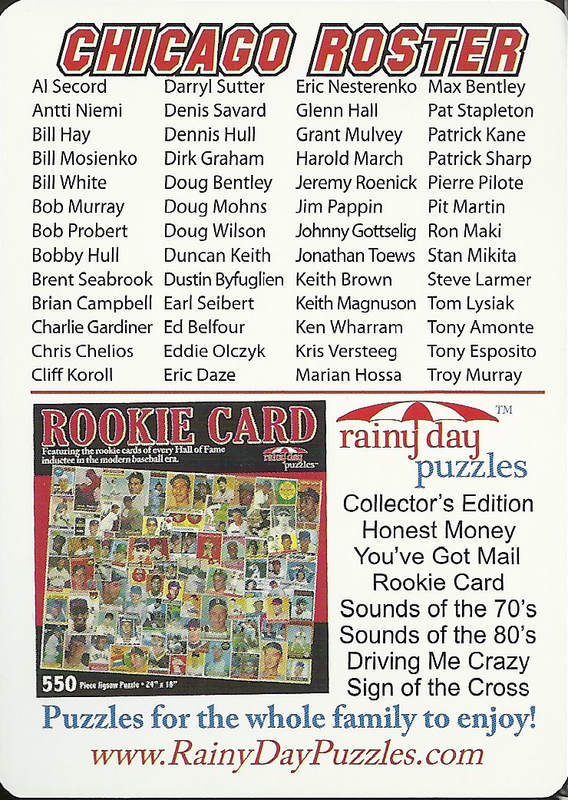 Along with Jake the Snake, I also realized that Anthony Rizzo appears on the box in which the set comes packaged and, additionally, the checklist now includes World Series heroes such as Ben Zobrist, Javy Baez, Kyle Schwarber, etc. 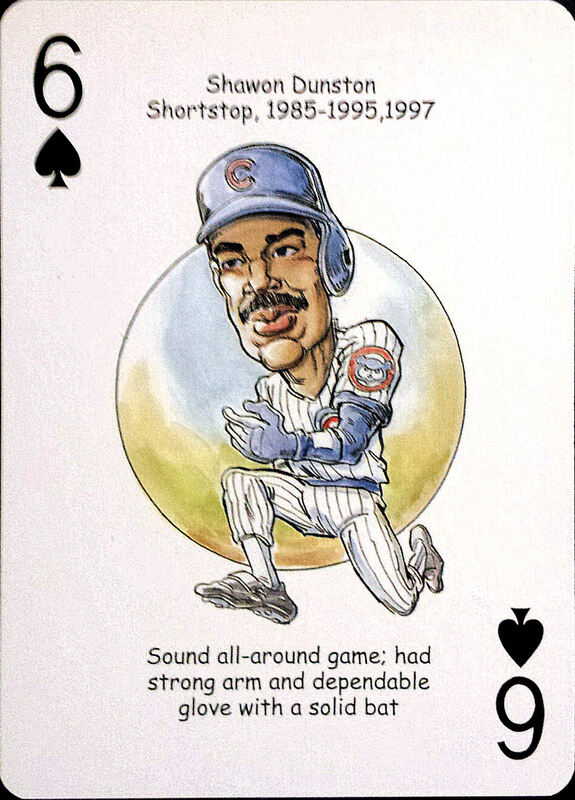 Gone are the days of Michael Barrett, Mark Prior, and Aramis Ramirez, so too are their cards. Alright - now this display had my full attention. 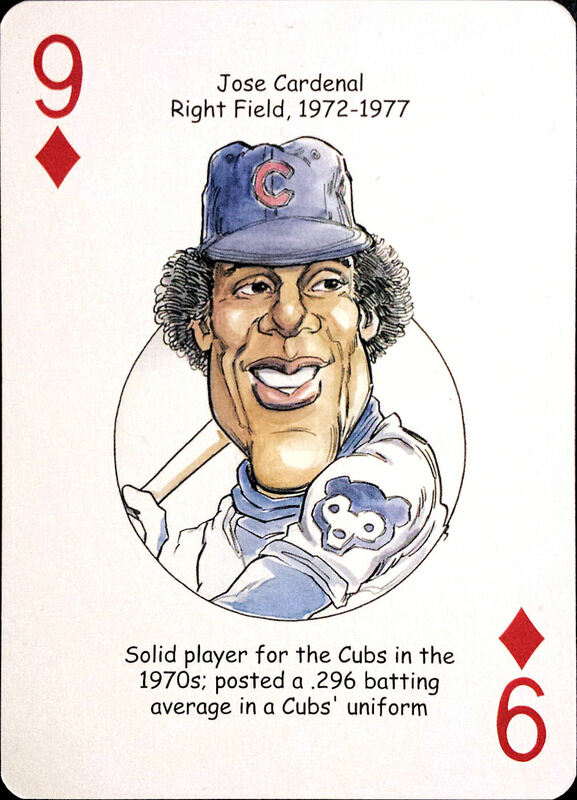 Even still, at eleven dollars a pop, a few new Cubs cards wasn't going to be quite enough to make me want to plop down my hard-earned money. I knew I was going to be an expensive date that night and I knew I'd be attending a card show the very next day. While it was quite tempting to add the update to my stocks, I decided to save that splurge for another day. 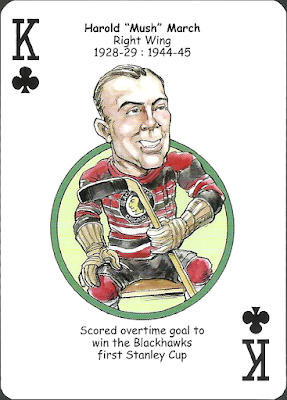 Much has been made of Spellcheck's football career at Notre Dame; however, the former wide receiver only has one or two, obscure cards which commemorate his gridiron career. 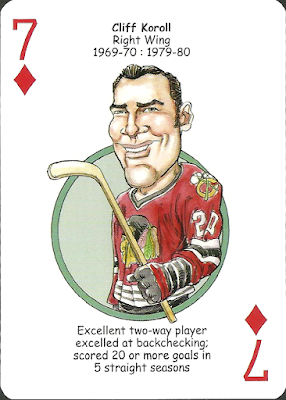 I sure wouldn't mind adding one to go along with my Matt Szczur Villanova football card. 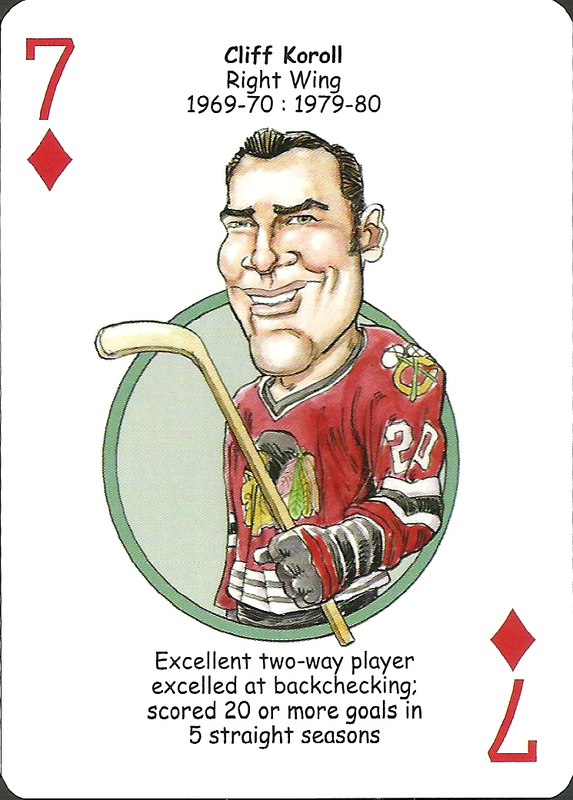 I suppose that really shouldn't come as a surprise, seeing as I have a budding all-time roster collection of Chicago's favorite hockey team, just as I do for the Northside baseball club. 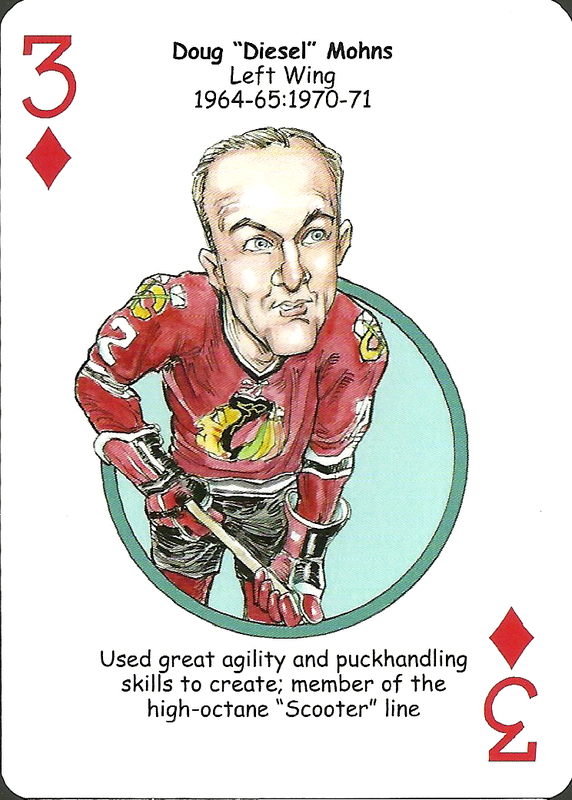 Seeing as how I've only been working on the former for a year or so and vintage hockey cards are tough to come by in reasonable condition or pricing, this Hero Deck looked to fill in some old-school gaps in my Blackhawks binder. 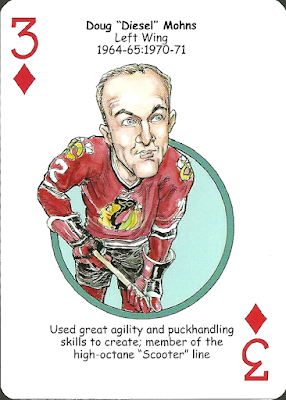 Kane, Toews, Hossa and crew aren't tough to track down, but once you get older than the 90's around here, the hockey card supply dries up real quickly. Therefore, I scooped this bad boy up, hurriedly checked out before I could change my mind, and we made our way over to the bar for dinner and drinks. 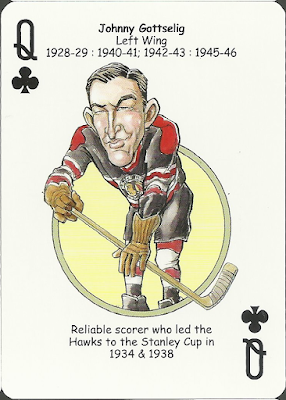 Seeing as the cards themselves offer up a brief blurb, I'll spare you the small player profiles I usually whip up for new additions to my roster binders - there's no need to be redundant. 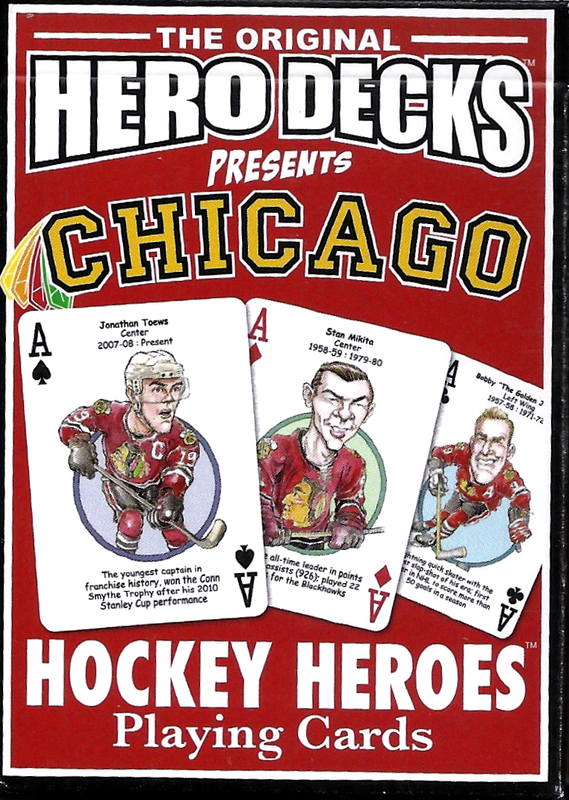 As you can see, Hero Decks really does their research and makes sure to cover all eras in a team's history, even one as old as the Blackhawks. For instance, I definitely don't have a lot of cards featuring skaters from the 1920's and 30's in this binder, but this deck offered up several of casino quality. 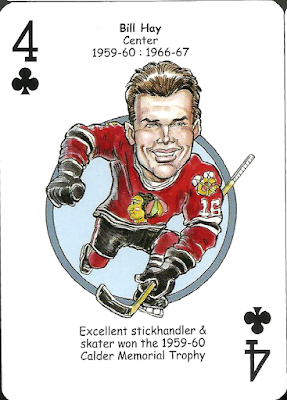 All told, across all eras of the franchise, I was able to add eight new Blackhawks to my all-time roster collection. That's a lot of new cardboard for one sitting! 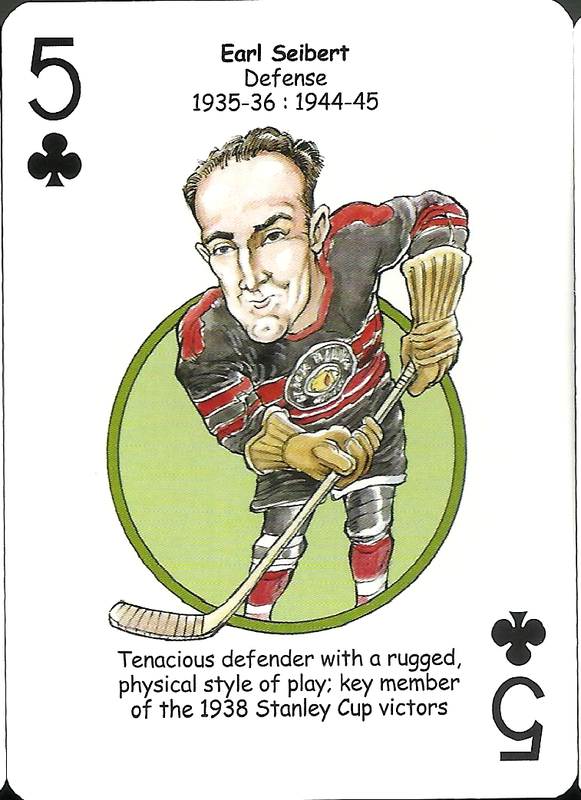 Nothing too exciting - you're not supposed to notice the backs of playing cards, after all. In addition to the eight new additions and forty-four other playing cards which make up the deck, the following checklist was included. Scanning the checklist, I'm sure that you'll agree with me that there aren't really any big surprises in the player selection for the Hawks, especially when you keep in mind that this deck appears to have been put together shortly after their Stanley Cup title in 2010. 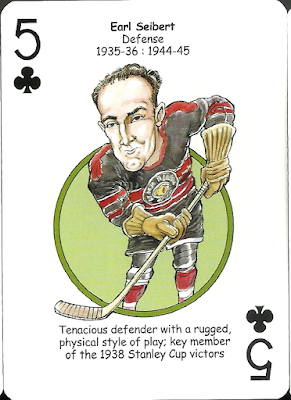 If I am ever forced to play fifty-two pickup with this deck, I'll be able to use this reference to ensure that I've gathered them all back up. 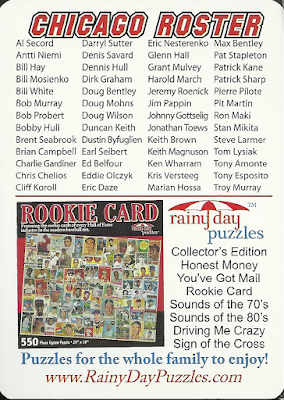 Along with the ad for neat-looking rookie baseball card puzzle, on the backside of this checklist card, we're also extended an offer for a free deck. I like free. 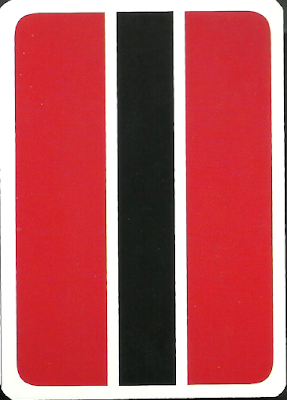 All one has to do is enclose this send this offer card in with a $5 check to cover shipping and handling and you can call dibs on whichever deck you want. Seeing as how these bad boys retail at eleven bucks, that's a sweet deal. 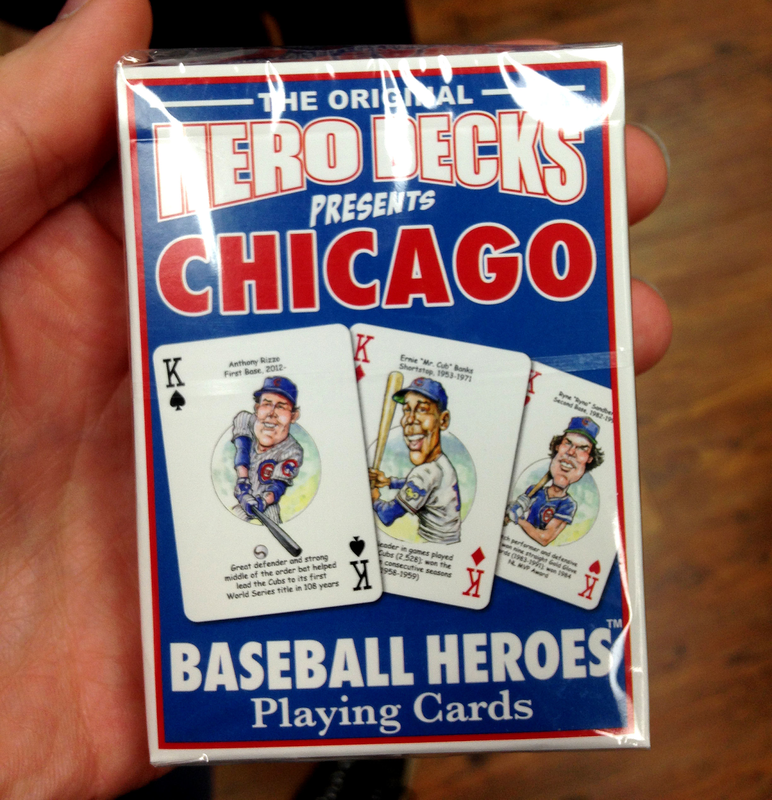 Hmmmm... maybe I'll be getting that updated Cubs Hero Deck after all.... 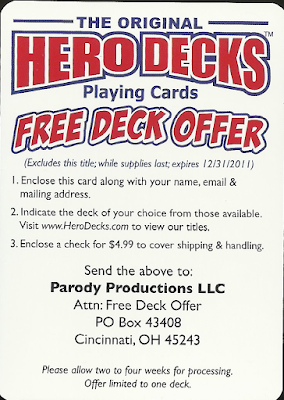 Although, I just noticed that the fine print here says that this offer expired in 2011... that could be problematic. To sum everything up, I walked into a random bookstore to kill some time and managed to somehow knock eight needed men off of my Blackhawks All-Time Roster checklist and discovered a new, oddball Cubs card set to pursue. Talk about unexpected! That alone would have left me smiling for the rest of the weekend. That being said, the card show I attended the very next day must have felt jealous because it too surprised me with a bountiful and unexpected card crop. Usually I hate "one-uppers," but I wasn't too bothered by this development. 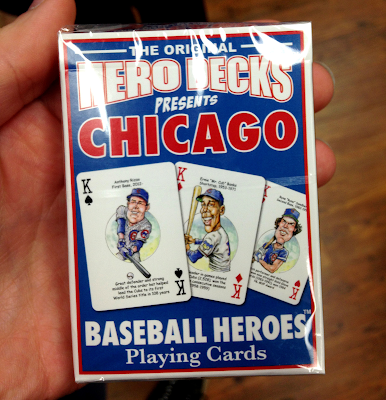 I'll show off the card show spoils tomorrow; in the meantime, I'm just going to enjoy this "heroic" haul. 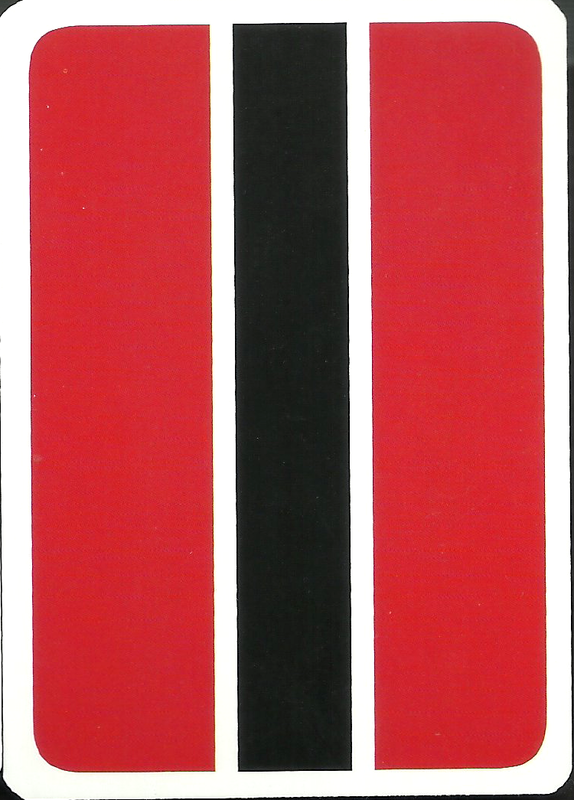 Those cards are fabulous! Good song too! Pretty cool oddball products. I truly clicked looking for the Foo Fighters song, thanks for delivering on that! 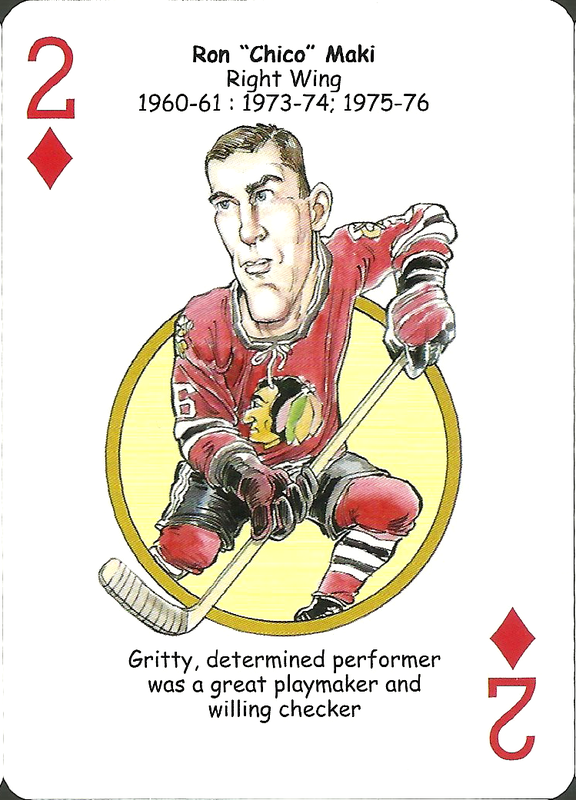 I wish Hero Decks produced cards for every MLB and NHL team. 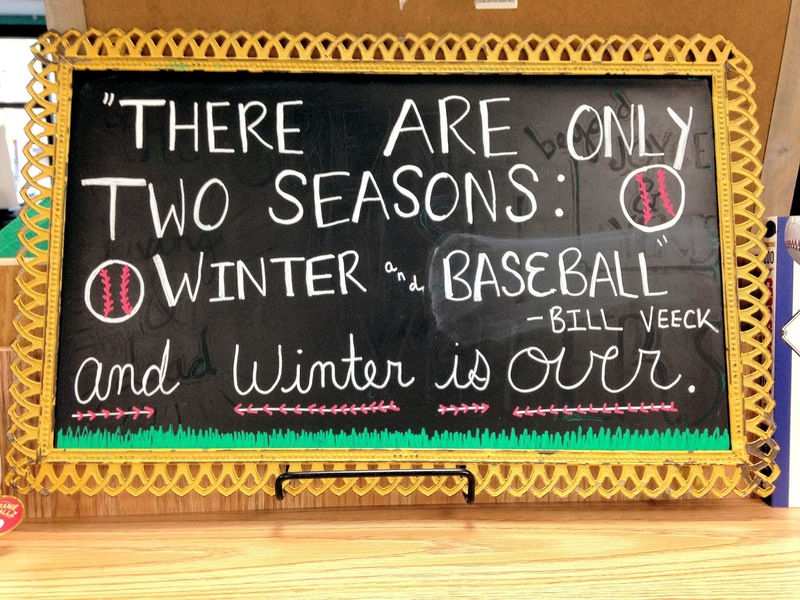 I'd be all over A's, Padres, and Sharks decks.